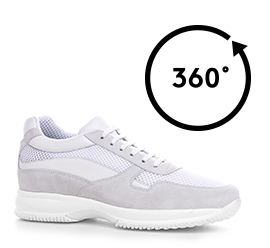 Total white elevator Sneakers, handcrafted, with upper in technical fabric and suede details. The comfortable sole is made of super lightweight rubber. A must-have for the spring / summer season, essential in the wardrobe of any man who wants to increase his height up to 4 inches in total comfort.